Students pose at the Femineer Gala, where female students showcased their work in engineering. Photos courtesy Downey Unified. DOWNEY — With only 15 percent of all engineering jobs occupied by women, Downey Unified has provided an opportunity for female students to fill this need and be more successful post-graduation by continuing to expand a female-focused engineering program, Femineer, throughout the district. In partnership with Cal Poly Pomona's Women in Engineering Program, the Femineer program has been put into place at all four middle schools and two comprehensive high schools within Downey Unified to provide more of an opportunity for these young women to learn firsthand what a career in engineering would encompass. 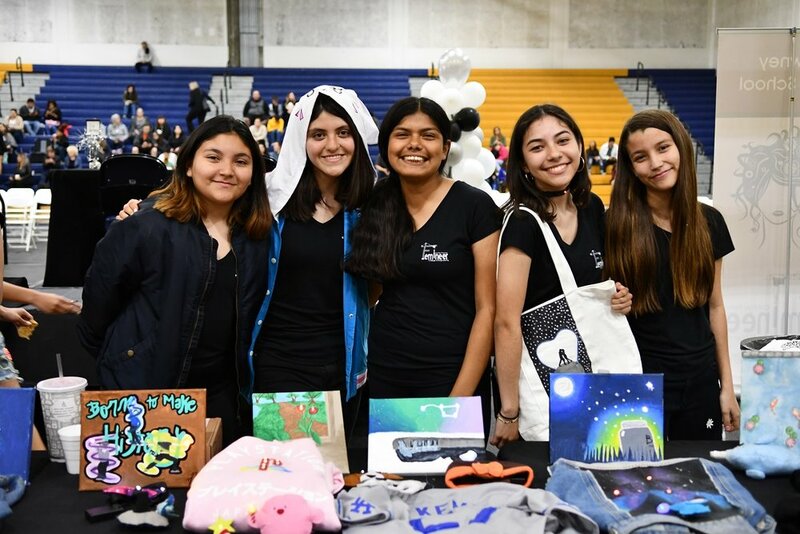 On March 21, the third annual Femineer Gala was hosted by Warren High School where the work of Downey Unified’s middle and high school Femineers were showcased. This event brought over 300 people in attendance to see what these more than 200 young future female engineers have been diligently focused on this school year. This gala was comprised of a runway show with wearable technology, moveable designs located in areas around the room and a panel session made up of female engineers. The wearable technology, modeled and sewn by the Femineers themselves, were created using conductive thread, which if wired correctly light up different pieces of garments and accessories. Movable designs were also created by the Femineers after only being given motors, sensors and a circuit board. A student models wearable technology created by the Femineers, a female-focused engineering program in Downey Unified. A new addition to this annual event, a panel of female engineers were present to speak to students about the various pathways in engineering and their experiences, and to also answer questions. The panelists included Dr. Cordelia Ontiveros, who holds a Ph.D. in Chemical Engineering from Princeton University and is the co-founder of the Femineer Program; Dr. Sonya Lopez, a first generation Mexican-American who has earned a Bachelors, Masters and Doctorate from UCLA and is currently the Associate Director within the NASA DIRECT-STEM Center at Cal State Los Angeles; Lauren Banad, a Downey Unified alumnus who received her Bachelors in Computer Science Engineering from USC and is currently working for Raytheon as a Systems Engineer; and Samantha Villagran, another Downey Unified alumnus who is currently a senior at Cal Poly Pomona studying Mechanical Engineering. Downey students show off their wearable technology. Cal Poly Pomona’s Women in Engineering Program was established by Dr. Ontiveros in 2012 to provide young women with the resources and supportive services to succeed in the fields of engineering. Annually, they host their “Introduce a Girl to Engineering Day,” inviting 100 young ladies from the middle school level to experience this event. Downey Unified students represent 80 percent of those in attendance. This all-day event is filled with hands-on activities exposing each student to the different areas in engineering including, Electrical Engineering, Civil Engineering and Chemical Engineering, to name a few.